This is an interesting one just popped into my blogosphere this morning via Jeff Utecht who got it from Doug Johnson. According to this online testing device my blog is 'Junior High School' reading level. It would seem that in comparison to Jeff's test, my blog is a little harder to read however I am on the same level as Doug...is this what it means? As an observation and as an international educator I am once again disappointed (that's not the right word, but it does give me a 4-syllable word that affects the next test!) by the US-centric terminology and result of the test. What is Junior High? Can we have an age level? Can we have a grade level? I think internationally that would be easier to understand. Through a comment from Paul Hamilton to Jeff's post I also explored Juicy Studio for more statistics (3 syllables!). 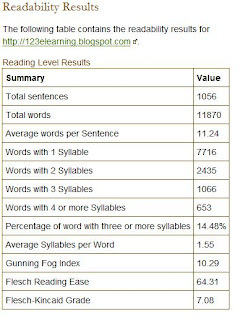 The results show that my percentage of 3 or more syllable words is just under 15%. "The result is your Gunning-Fog index, which is a rough measure of how many years of schooling it would take someone to understand the content. The lower the number, the more understandable the content will be to your visitors. Results over seventeen are reported as seventeen, where seventeen is considered post-graduate level." The Flesch Reading Ease: "The result is an index number that rates the text on a 100-point scale. The higher the score, the easier it is to understand the document. Authors are encouraged to aim for a score of approximately 60 to 70." OK, so I have a 64.31 here ...doing alright so far. "The result is the Flesch-Kincaid grade level. Like the Gunning-Fog index, it is a rough measure of how many years of schooling it would take someone to understand the content. Negative results are reported as zero, and numbers over twelve are reported as twelve." In comparison to the first test this one gives more detail but it is interesting to see how the two have lined up together. Essentially my blog is readable by people who have had about 7-10 years of schooling, are in the early years of high or secondary school. The discrepancy (4 syllables?) between the Gunning Fox (10.29 years) and the Flesch-Kincaid (7.08) meters is interesting...but a scholar of research and statistics needs to explain these in more detail for clearer understanding. 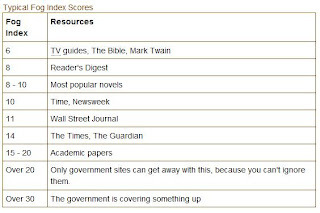 E-Learning blog has the same index score as Time or Newsweek! What does all of this mean? It has made me think about my blog and why I am writing it. I delivered a PD session the other day to teachers about getting started with blogging. I told them blogging had changed my life...in many ways. I told them that I mostly write for an audience and thanks to you (the person now reading this post, yes YOU!) I am gratified to know that someone is reading this blog. My audience were amazed! The concept and practice of blogging for an international audience is amazing. I try to keep some sort of erudite content in my blog but the loftier posts that link in with the blogosphere and comment and draw in on recent conversations take me a long time to write. The easier posts for me are the grass roots 'this is what I am doing and this is what my immediate circle of colleagues are doing'. It came in at elementary. I tested my wife's blog. It came in at genius. We both laughed at that. her blog is written in English and traditional Chinese. Hey Julie, mine's the same. I guess we are writing to make our blogs accessible to most (all?) of our readers. I know that's my aim. Also to keep it friendly. I love blogging and twittering. Thanks for that post .. I found it by googling blog readibility and you gave a good explanation! Thanks and good luck there.